have some kids that have really worked hard in the offseason. Noah Azure and Dylan Young have been running constantly, and Brandon Shaw is another one that has worked really hard and I hope he has a great year. The one thing I have been really pleased with all around has been our senior leadership; that has been outstanding.” The rest of the boys roster includes Jerzy Borowieck, Joey Bryd, Ethan Durward, Preston Glock, Dylan Goodman, Dylan Hanson, Wyatt Hanson, Kasee Henderson, Nathan Howard, Adam Ketchum, Joah Kinsella, Nolan Lotton, Preston Lowen, Casey Mariani, Noah Molitor, Zachary Monk, Nicholas Nelson, Brock Nystrom, Carter Nystrom, Jeremiah Parker, Garrett Parsons, Lane Paulson, Cameron Pleninger, Joaquin Sanchez, Tysen Sangrey, Magnus Steckel, Tyler Sunchild, Monty Terkildsen and Julian Top SKy. With limited time on the track to practice due to the weather and with one meet already canceled (Lewistown, April 6) the spring has already been unusual for the Ponies but things will get back to normal. Havre will be in action in Havre this week, competing in the Cal Wearley Invitational hosted at the Havre Middle School track by North Star High School. Other notable events on the schedule for Havre include the Havre Lions track meet which will be in Havre April 13, as well as the annual Glasgow Top 10 meet which is set for April 30. The Ponies will also host the Havre Invitational May 4, before traveling to Belgrade for the Eastern A Divisional meet May 17-18. Class A state track will be May 24-25. Havre Daily News/Colin Thompson Havre High's Noah Azure is part of a large contingent of Blue Pony athletes out for track and field this spring. The Ponies are once again led by longtime head coach John Ita. action before the start of conference play. In addition to the Central A schedule, Havre also has a home-and-home scheduled against Glasgow, while the Ponies will also the Havre Invitational May 4. After hosting divisionals last season, the Ponies will head to Lewistown for the Central A tournament May 18. The Class A state tournament will be held in Polson May 23-25. Havre Daily News/Colin Thompson Above: Turner's Cody Welsh, right, is the defending Class C state hurdles champion and is one of many top track and field athletes returning to the District 9C this season. Below: Fort Benton's Leah Gannon is part of a loaded Longhorn girls track team that will contend for the Class C state championship again this season. Cal Wearley Invitational. 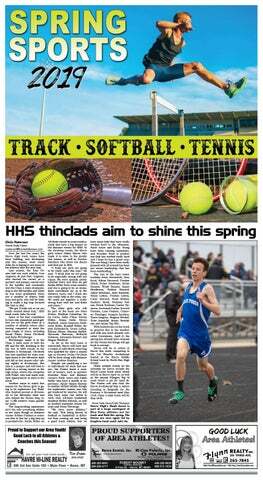 The Fort Benton girls and North Star boys will defend their district titles at the 9C track meet in Havre May 8. The Northern C Divisional is May 16 in Great Falls and this year, the Class C state track meet will be in Laurel May 24-25. Havre Daily News/Colin Thompson Havre High's Marcee Murphy hits a backhand during a 2018 tennis tournament last spring. Murphy and the Blue Pony tennis teams have already begun their 2019 season, and both the Blue Pony boys and girls teams are loaded for success again this year.